OK, so I’m not sure if this will work – the picture above should be a slideshow of 7 portraits done from life. (Press Play – I had to make it into a movie). Five of them were from my last portrait class, one was done at home and the other was done at Art&Soul Studios during an opening we had in November… If it doesn’t work, I’ll try something else. If that doesn’t work, then I’m stuck just pasting 7 images in the blog. Tomorrow starts another session of portrait classes for me – I’m taking them with Herb Slapo at the Carrboro Arts Center. (Not to be confused with the one I’ll be teaching in Mebane!) I have a really fun time going there and being with other artists and drawing from life (from a willing subject). Notice the slides above from the last session (if it works) – the first week started with the pencil portrait and I felt extremely rusty. It just wasn’t clicking with me. The second week I decided to bring my charcoal and it was so much easier. Maybe it was because I loosened up a bit, maybe it was the medium, maybe both. Or, it could have been the subject. I decided to work with charcoal for the next session, then the next, etc. For me, charcoal tends to force me to stay loose. I should point out that I don’t use a charcoal pencil. I use the vine or willow charcoal and tissue to blend. 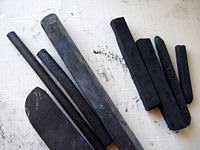 (The charcoal I use looks like the one 2nd from the left in the picture below). I’ll be bringing my charcoal to the next class…but I might bring some pastels too. We’ll see!!! REALLY nice drawings. I can’t wait until I have more time to draw from life. There’s a special depth to it. Keep up the great work! Thanks Darla – it does take time out (and you have to have a willing subject! )but I’ve found that if I don’t take the time – or ask someone to pose, then it doesn’t get done! I should ask my husband to pose, or I could just sketch him when he’s on the computer, lol!